Years ago, if you needed cataract surgery, you would go through a cumbersome process that required an overnight hospital stay. The healing process to fully recover your vision would be lengthy. Fortunately, things have changed. Our highly skilled cataract and lens implant surgeons utilize advanced surgical techniques. Your cataract surgery experience will be comfortable, with minimal discomfort and interruption of your daily activities and lifestyle. Using different eyeglasses, magnifying lenses, or stronger lighting may provide a temporary solution to cataract problems. However, they will not provide permanent improvement, since cataracts tend to become worse over time. Cataract surgery is the only effective treatment. The surgical treatment of cataracts involves removing the cloudy lens and replacing it with an implantable lens, called an intraocular lens (IOL) or lens implant. When a cataract substantially interferes with your everyday activities, such as driving, reading, or watching TV, it is time for you to have it removed. In most cases, waiting until you are ready to have cataract surgery will not harm your eye. However, it is sometimes necessary to remove a cataract, even if it doesn’t seem to cause problems with your vision. This is the case if it prevents a thorough retinal examination or treatment of another eye problem, such as age-related macular degeneration or diabetic retinopathy. The decision to have surgery should be made together with your doctor. Most often, your surgeon will employ a technique called Phacoemulsification, or Phaco. A very tiny incision, about an eighth of an inch (1/8"), will be made on the side of the cornea, the clear, dome-shaped surface that covers the front of the eye. He will then insert a microscopic probe that emits ultrasound waves to soften and break up the cloudy center of the lens. This material will then be removed by gentle suction. If you have cataracts in both eyes, your doctor will remove them one at a time in order to achieve the best possible results. Sometimes the cataract has advanced to the point that phacoemulsification cannot break up the clouded lens. In such cases, your doctor will make a slightly larger incision, about three-eighths of an inch (3/8"), and will remove the lens in one piece. 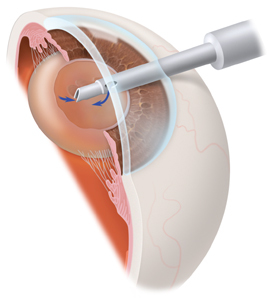 This procedure is called an extracapsular cataract extraction. Regardless of the type of procedure your doctor uses, your surgeon will normally replace the removed lens with an IOL or lens implant. The IOL is a clear, artificial lens that requires no care and becomes a permanent part of your eye. With an IOL, you'll have improved vision very quickly because light will be able to pass through it to the retina. Although the IOL becomes a permanent part of your eye, you won't feel it. Prior to your surgery, the front curvature of your cornea as well as the size and shape of your eye will be measured. This information is used to select the right type of IOL. You should not eat or drink anything after midnight the night before your surgery. On the day of surgery, you will be welcomed by a staff member. The staff will help you prepare for your surgery by putting eye drops in your eye. You will be given a gown to wear over your street clothes during your actual surgery. The area around your eye will be thoroughly washed. Then your eye will be numbed, and you will be given a mild intravenous sedative to help you relax. The cataract and lens implant surgery itself usually will take about 10 minutes. In most cases, your eye will heal without the need for stitches or an eye patch. After your surgery, you will rest in a comfortable reclining chair, and we will offer you some refreshments. Your family members may then join you in reviewing your follow-up care and schedule. You may be given medication or eyedrops to prevent infection. Your entire outpatient surgical visit will take less than two hours. At that point, you will be able to go home. Since you will not be able to drive on the day of surgery, you should make arrangements for someone to drive you home. You will be called later in the day to check on your progress. In general, you will be able to return to your normal daily activities by the following day. To check your progress, you will see your doctor the day after your surgery. You will continue to be seen by the doctor for a series of scheduled follow-up visits to ensure that your vision is progressing normally. Most patients who have cataract and lens implant surgery are amazed at how well they see the first morning after surgery. You can expect to continue all of your normal daily activities the next day. Your eye may be itchy, and there may be mild discomfort for a few days after the surgery, something that is normal. You should avoid rubbing or pressing on the eye. If you notice crusty residue, you may use a clean, damp facecloth to gently remove it. In most cases, by the end of the first week after cataract surgery, your vision should be stable. With any surgical procedure there are risks. Some of these include infection, detached retina, bleeding within the eye, or edema of the cornea or central retina. These conditions are usually successfully treated with medications or with additional surgery. While some discomfort is normal, you should contact your doctor immediately if you have severe or increasing pain that does not respond to over the counter medication. If you should experience a sudden onset of floaters or flashes in your eye, this can be an indication of a detached retina. You should notify your doctor.